Award-winning writer Geoff Johns first (of many!) 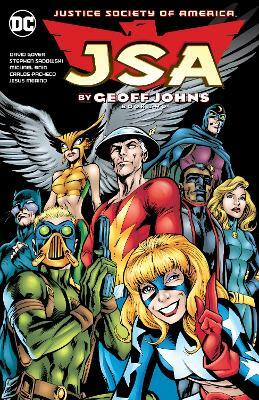 award-winning, critically acclaimed series is now collected in this re-cut graphic novel series, continuing in JSA BY GEOFF JOHNS BOOK TWO! This volume sees the reunited JSA face the foe that decimated their ranks years prior: Extant! Also, the stunning, much ancitipated return of Hawkman! Mixing classic heroes such as Green Lantern, the Flash and Wildcat with a younger generation of crime-fighters like Starman, Black Canary, Hawkgirl, Atom Smasher and the Star-Spangled Kid, Johns revitalized the series and began a career that would see him write such incredible graphic novels as JUSTICE LEAGUE VOL. 1: ORIGIN, BLACKEST NIGHT, BATMAN: EARTH ONE VOL. 1, FLASHPOINT, INFINITE CRISIS, DC UNIVERSE: REBIRTH and many more! With contributions from David S. Goyer (screenwriter for THE DARK KNIGHT TRILOGY), James Robinson (STARMAN) and more, this series set into motion one of the great runs in comics history! Collects JSA #6-20, SECRET ORIGINS OF SUPER VILLAINS #1. Geoff Johns is an award-winning writer and one of the most popular contemporary comic book writers today. Johns is the author of the New York Times best-selling graphic novels Aquaman- The Trench, Blackest Night, Green Lantern- The Sinestro Corps War, Justice League- Origin, Superman- Brainiac and Batman- Earth One, which hit #1 on the bestseller list. He is also known for transforming Green Lantern into one of the most critically and commercially successful franchises in comics. Johns was born in Detroit and studied media arts, screenwriting and film at Michigan State University. After moving to Los Angeles, he became an assistant to Richard Donner, director of Superman- The Movie. He and his mentor Donner later co-wrote SUPERMAN- LAST SON, featuring the return of General Zod. Johns has written for various other media, including episodes of Smallville, Arrow and Adult Swim's Robot Chicken, for which he was nominated along with his co-writers for an Emmy. He is the Chief Creative Officer of DC Entertainment and resides in Los Angeles, California.